2018 dates TBA, check back soon! 2017 SOLD OUT 6 months in advance. Your life is calling you—say Yes! The life you crave is one degree of change away—and you can make the shift. Stop thinking about how you’d like to live—move toward it! Join this exciting and innovative experiment, one that can help you begin to savor your life and flourish so that you can give more to the world. This is not just philosophy; this is about action. Using yogic principles, discussion, meditation, movement, self-inquiry, and self-reflection, you’ll learn to act on ancient principles of contemplative wisdom, transforming your life by diving into it. Abandon old beliefs that keep you stuck, and discover new values and meaning that can empower you to start feeling more alive, connected, and inspired to get going. You’ll emerge from this certificate program with the visceral understanding that every moment is a bold opportunity to thrive and step into your role as a leader. Your take-homes? Tools and wisdom to embrace full ownership of your existence and a real map that you can use for the rest of your life. Be part of an amazing community–get inspired, laugh (a lot), move, dance, share, celebrate, play, go deep, and get ready to have a trip of a lifetime. During our time together you will dive deep into your life purpose, be immersed in tools that will guide you to create a service project. You will identify what your life is really about and how you can take a stand for what you love–which could be anything! The goal is to get you going to live your dharma–your unique life purpose. By transforming oneself the world transforms. This is how true transformative change occurs, this is leadership. Our deepest calling is to grow more and more into our authentic self — this is the work of a leader — and constitutes the redefinition of past leadership models. We are all called to leadership. Leaders consider this life precious and are thus willing to act deliberately in service to life. Moreover, leadership is an inward journey into the depths of what it means to be human. Leadership is about being fully expressed, about being called to one’s greatness, and about having the courage to act in ways that are in alignment with one’s highest self. The world relies on each of us to heed the call of our heart. There is a divine unfolding of life to hear your personal calling, and the path of yoga can provide the tools to answer this call, and to live a life of possibility, passion and integrity. By liberating your own heart and stepping fully into your authenticity you inspire others to do the same — this is the new way of leadership. You are hungry for self-exploration, inspired action, ready to ignite change, delve into the power of community, you want to make a difference in your life and in your world, are open to collaboration, cooperation, you have passion and certain it’s your time to thrive–then you have found the right program. You are not ready to “do the work”. If you are unwilling to accept feedback. If you like to complain. ***There are pre-assignments before the training begins and homework assignments between each call. Optional skydiving, ceremony, community service project, and hiking in the stunning Berkshires. Does not include food and housing. There are an array of housing options–once the program is filled you can contact other participants and look to share housing. A few meals will be provided and all other meals you will be given a list of near by places to eat and grocery stores. Cost for this transformational journey: Early-bird special $1800 if you register and pay non-refundable deposit by June 15, 2018 and pay in full by July 15, 2018. After June 15, 2018 cost of course is $1950. Non-refundable deposit is $900. Payment is due in full by September 1, 2018 for those not doing the early-bird pricing. The intention of this blended learning training is to make it more affordable and accessible. It’s just going to be amazing. 3 amazing meals daily, shared accommodations (private rooms available, please inquire about price), 1 surf lesson, 1 zip-line excursion and other fun Costa Rican surprises! Cost for this transformational journey: $3800 (payment plan available)–EARLY BIRD SPECIAL $3400 if you register and pay non-refundable deposit by TBA and pay in full by TBA. Does not include airfare, gratuity, or departure tax. The program is highly interactive, each session includes individual, dyadic, and group exercises. Each session you will explore practices for self-awareness, clarifying vision, relationship and communication building, mindfulness and meditation, yogic wisdom, movement and expressive arts to awaken creativity, and more than you could imagine. What is missing in your life, with the presence of would have your life more fulfilling? Describe your relationship with feedback. What specific life experience has most helped you in your personal development? Professional development? 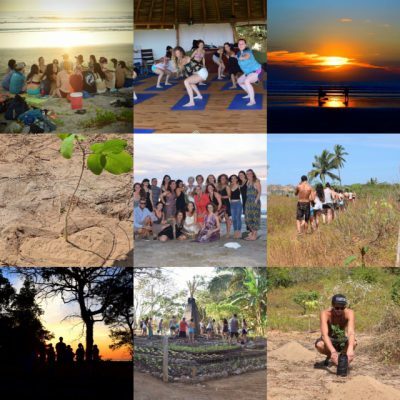 What motivates you to join the Karma Yoga Leadership Intensive? How would you describe what leadership means to you? What is a specific challenge you have encountered and how did you handle it? What specific skills and strengths will you bring to the training? How will these support the community? What does commitment mean to you? Two-options for payment either early bird special or full price payment plan. To receive early-bird special you must register by June 15, 2018 and pay in full by July 15, 2018–save $150! Final payment for payment plan is due September 1, 2018. Two-options for payment either early bird special or full price payment plan. To receive early-bird special you must register by TBA and pay in full by TBA–save $400! Final payment for payment plan is due TBA. For upcoming trainings please visit Coby’s calendar or to book her please contact her through the connect page.